One of the biggest travesties as far as Dartmoor archaeology is concerned must be the forestation of the area around Bellever and to a lesser extent, Laughter tor. The forest was planted by the Duchy of Cornwall in 1921 in order to replenish wood supplies and this effectively blanketed about 5,000 years of history. Due to the size of the area I will divide it into two web pages, ‘Prehistoric Bellever’ and ‘Laughter Tor’. The 3D aerial map below places the major features within their topographical context and as can be seen they are all located on the lower slopes around the tor. 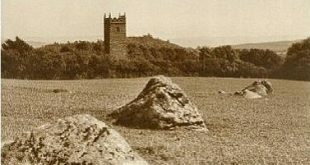 Originally there were two double stones rows that ran down the southern slopes of Laughter Tor. The first started at the menhir and the other ran parallel just to the south, this second one is now virtually lost. The first one is divided into two sections and has many of its stones missing from their original position. You do not have to look far to discover their fate as the nearby newtake wall will testify. The first remaining section of the stone row is located about 17m from the menhir and consists of eight stones that form a double row at 1.7m intervals. There is then a space of roughly 120m when another three stones stand in-situ and a short gap then leads to the final 14 stones. The entire length of this double stone row is 164m which suggests it is likely to have been the original construction. The second stone row has virtually been obliterated from the landscape, there are vestiges of it to be found just west of the menhir but most of it has been buried in the turf and peat. Although the menhir is located just below the crest of the hill it can never-the-less be seen from quite a distance. It stands at 2.4m high and is situated in the centre of what was a small cairn. This was excavated in 1903 by Burnard who discovered large quantities of charcoal and what appeared to be peat ash. The actual standing stone has a some point be re-erected and is now marginally out of alignment to the axis of the rows. When Burnard did his original fieldwork in 1903 he recorded eight small cairns of which three of them were excavated. All the kists contained huge amounts of charcoal and the mouths of the burial pit had small pyramids of small stones which were angles downwards. The sites of these eight cairns have to date been lost and possible lie awaiting re-discovery. As with the Bellever area there are several remnants of settlements or farmsteads located around Laughter Tor. Unfortunately they are now under a layer of vegetation and many of the stones have been re-used in the newtake walls. The example to the north of the tor is probably the best preserved and was more than likely a farmstead. At the centre is an enclosure (A on the map below) which measures some 36m across, this surrounds two huts. The first hut stand freely in the centre of the enclosure and measures 4.4m across. The other is attached to the enclosure wall and measures 3.8m. A second outer enclosure (B on the map) was built onto inner enclosure. The partial remains of a third (C on the map) enclosure have been revealed following some felling of the trees. There are possible indications of other huts within these walls. A large settlement appears on the western slopes of Laughter Tor and comprises of a pair of huts and some 12 fields all of which increase in size away from the centre. Both of the door jams are still in-situ at the hut marked 1 on the map, the actual hut measures 8.2m across and faces the original paddock gateway. The second hut, marked 2 on the map is a much smaller example and measures 4.4m across, This hut has been built across the edge of an adjoining field. The third settlement lies to the east of Laughter Tor and over the years has received a great deal of damage. No less that three newtakes cut through the site along with a whole series of banks and ditches which are thought to have been of a medieval origin. Again many of the stones have been removed and utilised in the building of the newtake walls thus making it virtually impossible to have any idea of the settlement’s context. There are however several damaged hut circles located within the enclosure walls. Some of the monuments in and around the Bellever/Laughter Tor/ Lakehead Hill area at one time each had a numbered post which related to it’s description etc. As a result of time and weather (possibly vandalism) some still have their number posts in-situ and some have lost them. Either way from what I can establish there is no accessible key to what the numbers relate to which can be slightly frustrating if one is not conversant to the area. However, I did manage to get hold of a copy a sheet that lists each monument, its corresponding number, the scheduled monument number and the OS grid reference along with a map. This key and map has been reproduced HERE for anyone wishing to visit the area, it is advised the map be used in conjunction with an Ordnance Survey map. Please note that the map had been adapted from an old Ordnance Survey map and so the tree cover shown is much less today.